Mulayam expels Akhilesh from Samajwadi Party. But who will have the last laugh in this family war? It certainly came as no shock when Samajwadi Party supremo Mulayam Singh Yadav expelled son and UP Chief Minister Akhilesh Yadav and cousin Ram Gopal Yadav over 'indiscipline'. The move essentially implies that after months of speculation, the party may now be finally staring at a split. It was the second instance in the country of a party suspending its CM on the same day, after the People's Party of Arunachal suspended Pema Khandu. Now, speculation is rife if Akhilesh will resign. It looks unlikely, for he is said to enjoy the support of a majority of MLAs and MPs. "90% of the MLAs and MPs are with him," a Rajya Sabha MP of the party told Catch. Even Governor Ram Naik told a news agency that he is watching the situation closely, although he termed it an 'intra-party' issue. "Who remains CM will be decided by the group of MLAs, not by any other individual," the MP said. Moreover, other parties like Congress and the Rashtriya Lok Dal may support Akhilesh if he cannot pull off the required numbers from within the SP. Both these parties are said to have been in talks with him over an alliance, and have been waiting and watching the family drama unfold before taking a final decision. As Catch had earlier reported, Akhilesh also first wanted to sort out intra-party issues before deciding on the issue of alliances for the crucial polls. This defies the claim by father Mulayam that Ramgopal Yadav had spoilt Akhilesh's future. The decision to oust Akhilesh sparked off angry protests outside the CM's residence. If insiders are to believed, the decision may spell the end for Mulayam as the national president of the party. 'Bhaiyya' (Akhilesh) may take over the reins of the party from 'Netaji', his father. But it came as no surprise. After all, Akhilesh released his own list of candidates after Mulayam and Shivpal had left out a lot of his supporters from the party's official list. The ones who were left out included some of the CM's close aides, including Arvind Singh Gop and Abhishek Mishra. "It's some thekedars (contractors) and outsiders who have sabotaged the party," the party MP told Catch, pointing a finger at Mulayam's brother Shivpal Yadav and close aide Amar Singh. He also explained how the parliamentary board of the party was not taken into confidence before selecting candidates. "There was no meeting. The list would just be decided by Amar Singh and Shivpal Yadav, and would readily be signed by Mulayam Singh," the MP claimed. Akhilesh and Ram Gopal are both members of the parliamentary board, the highest decision making authority of the party. In a meeting with his supporters on Thursday, Akhilesh, after being prodded by his supporters to take the fight to a finish, had sought four hours, and said he would not disappoint them. By evening, he had come out with his own list. The Mulayam faction of the party now includes a handful of leaders including Shivpal, Amar Singh and Beni Prasad Verma (two senior leaders who had recently rejoined the party), and Azam Khan, who is keeping his cards close to his chest by staying put in his constituency Rampur. Ram Gopal has announced an emergency session of party delegates on Sunday, 1 January. Big decisions are expected at the meeting, which will have all the delegates of the party coming in from all over the state. "The future of who controls the SP will be decided in the meet," the party MP said. It is expected that if the majority of the delegates decide to oust Shivpal and Mulayam, and bring in Akhilesh in the party's decision-making role, the confrontation would then move on to who gets to contest on the party symbol. And in the eventuality of the matter going to the Election Commission of India or to the courts, both factions may have to contest elections on different symbols. A reconciliation at this stage looks unlikely, because insiders say Akhilesh is under a lot of pressure from his supporters to not take the easy way out. 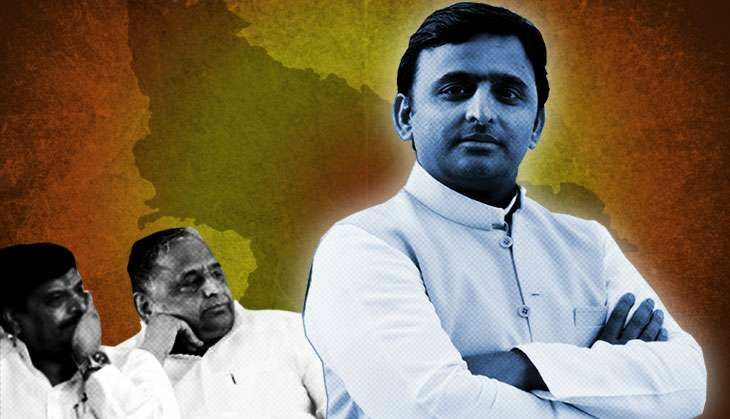 Who has more support would also become clear on Saturday in the two meetings - the first of party MLAs called by Akhilesh at his Kalidas Marg residence, and the other of the declared candidates called by Mulayam in the afternoon. "By taking this brave decision, Akhilesh has cemented his position as the new face of the party," an aide pointed out. "He had the option of going in for a compromise, since his father and uncle would have heeded to his demand to accommodate a few of his people." TWEET THIS Samajwadi Party Rajya Sabha MP tells Catch: Mulayam expels Akhilesh from Samajwadi Party. But who will have the last laugh in this family war?